Holy matrimony involves a lot of responsibility. 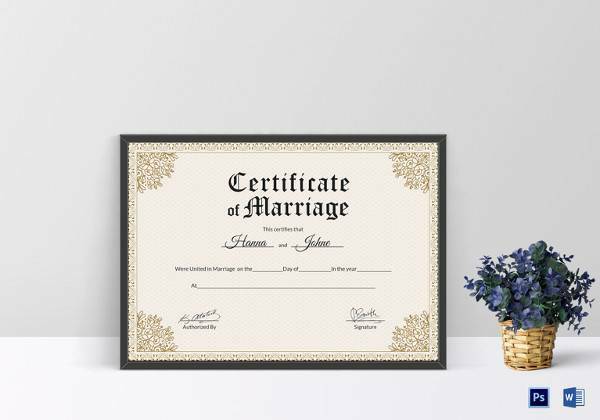 A certificate of marriage plays a very important role in insuring that the couple does not face any problem while opening a new bank account or applying for a visa. 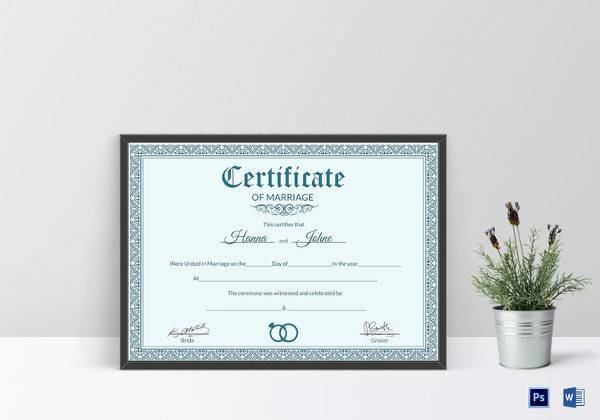 Besides these reasons, in case there is a dispute in the relationship a marriage certificate proves to be an important piece of evidence. 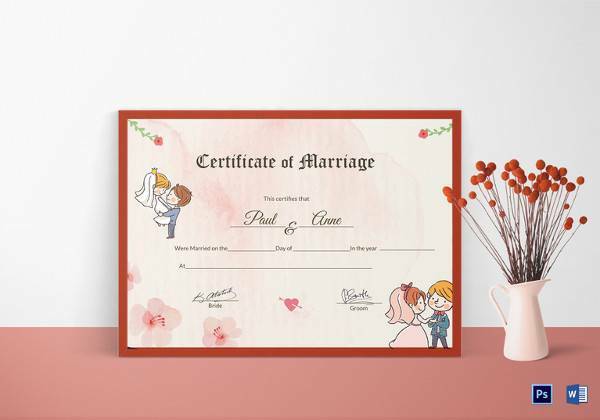 Here is a list of some of formal as well as informal marriage Certificate Templates that we hope would help you to get your marriage documented in an artistic manner. 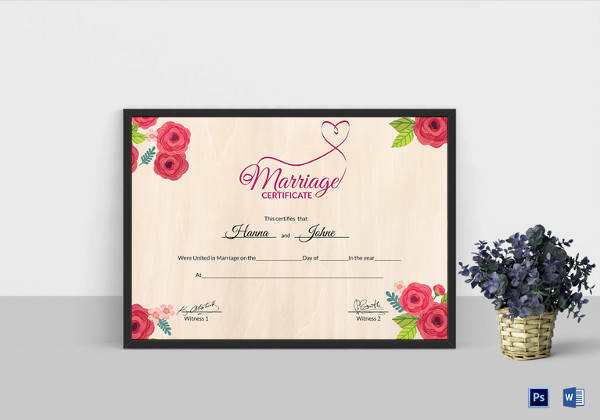 This sample of PSD marriage certificate template is available in both MS word and Photoshop file format. It supports CYMK color format and 300 DPI. The dimension of this template is 11.69×8.26 inchs. The design of this template is extremely simple and is entirely customizable. The font used is italic, which is changeable. Details regarding the name of the couple, date and venue are only mentioned. 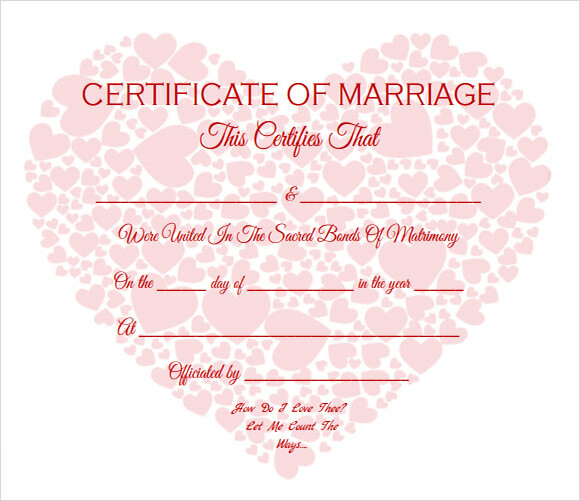 This example of printable marriage certificate template has a more colorful design with images of red heart adorning the four corners of the template. The entire certificate in drafted in red color and has a beautiful poetic quote at the end of the paper. 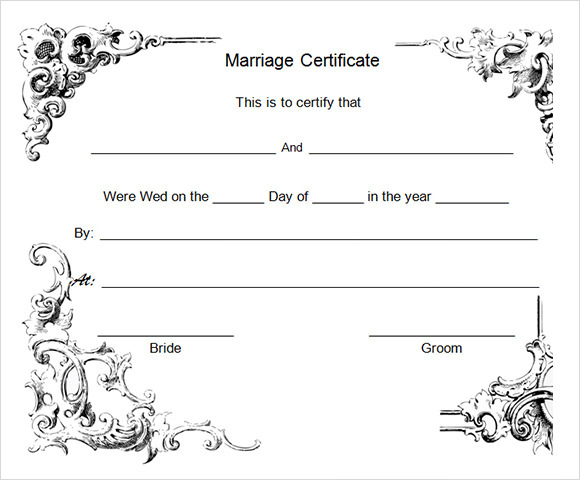 This template is very easy to edit and contains all the necessary information regarding the ceremony. 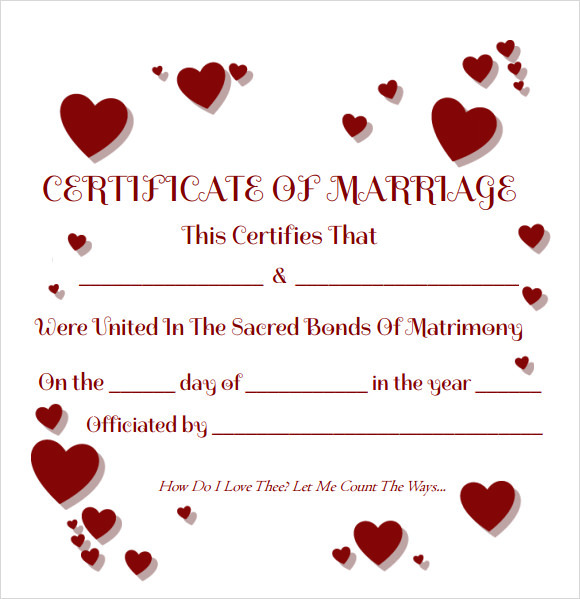 The catholic marriage certificate template is specially designed for believers of the Catholic cult of Christianity. It is a simple template that has an image of a cross and flowers on the right hand panel. The name of the couple along with the name of the witnesses and the date and venue of the ceremony is specified on the left hand panel. 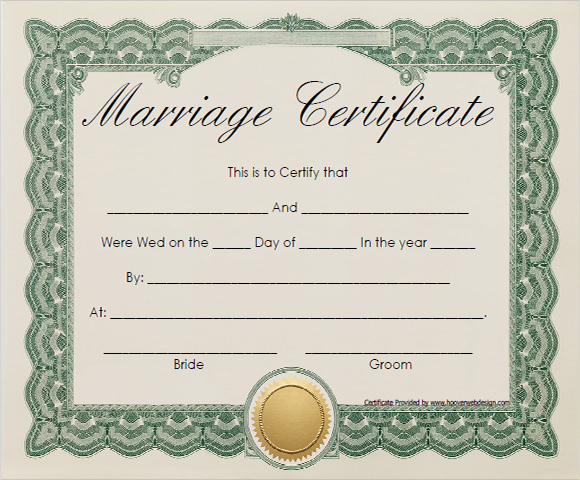 This is a simple and elegant design of a marriage certificate available in PDF format. 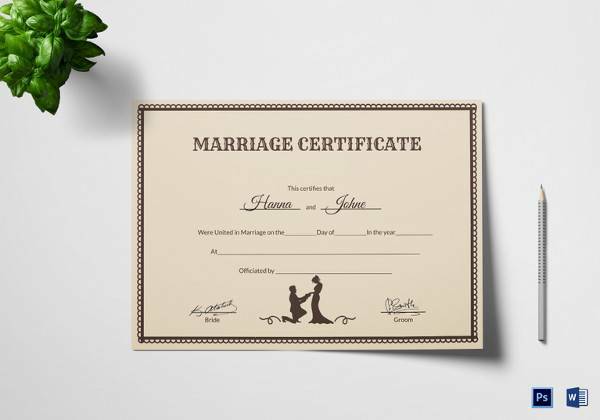 The certificate has a grey background and elaborate borders designed in pale greenish color. 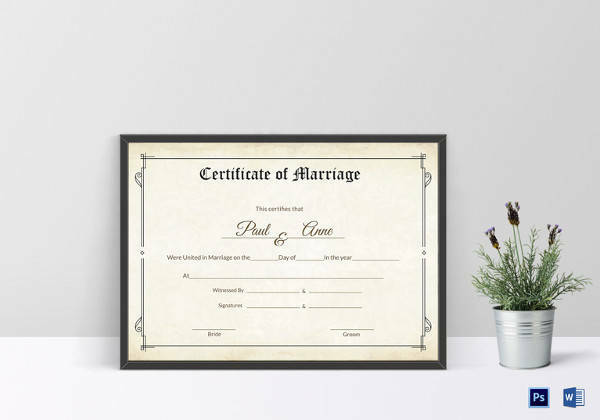 There is an image of a golden seal on the bottom section of the page and details of the bride and the groom is presented in a simple and well documented manner. 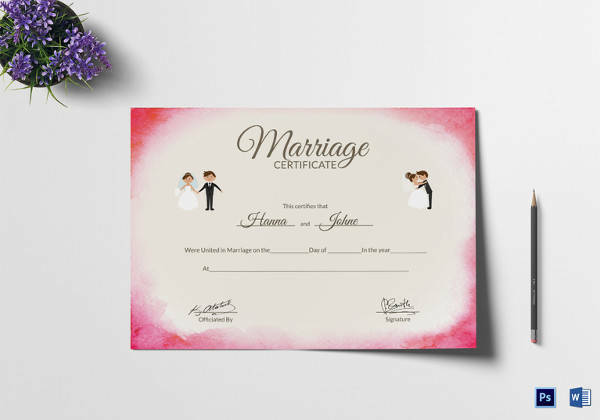 This is yet another example of a simple and artistic template designed to authorize the holy bond of matrimony. This template has a design of a large red heart in the background. All the details regarding the wedding including the name of the couple date and venue of the wedding is written in red ink. There is a beautiful romantic quote at the end of the template which can be omitted or customized as per the demand of the customers. 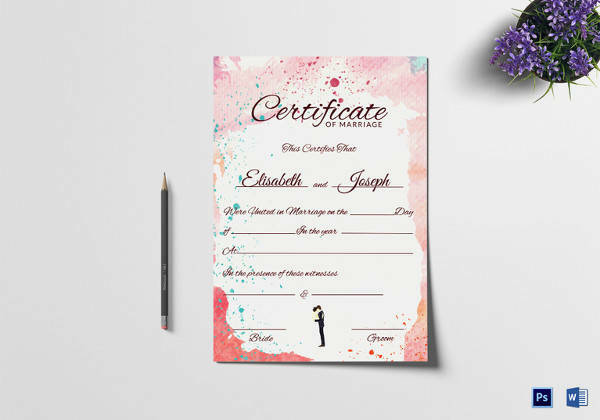 This version of printable marriage certificate is a fine example of a marriage template that is both simple and artistic at the same time. This certificate has narrow orange orders, with images of two small flowers on the upper corners of the page. 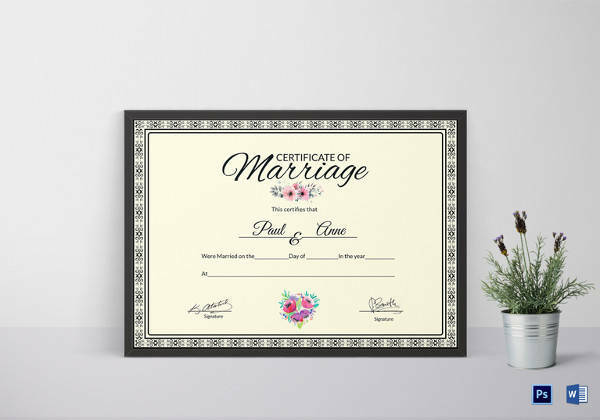 The entire template is designed in white background and has the provision of writing the details of the ceremony in black ink which gives it a formal and sophisticated look. 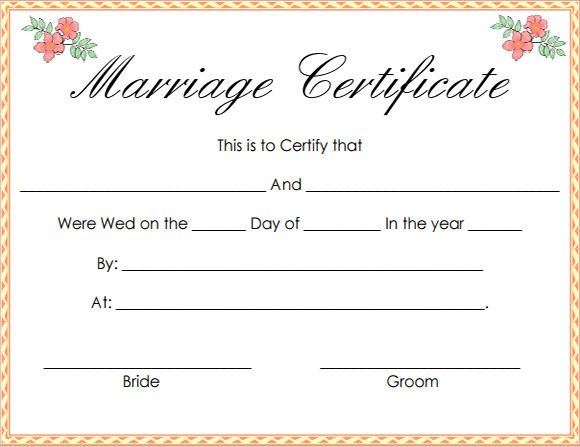 This marriage certificate template is available in MS word format which makes it easy to print and download. This template has a grayish blue background along with beautiful floral patterns on all four sides. 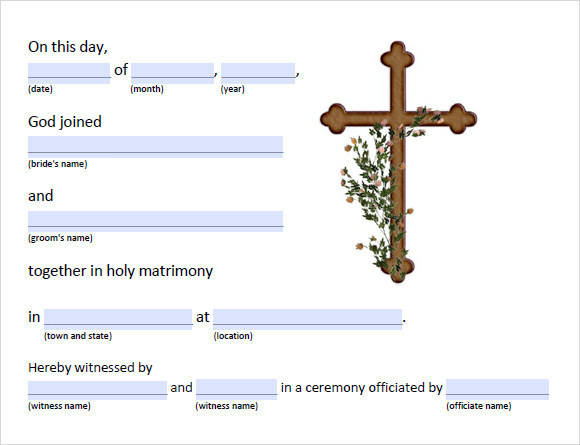 The name of the groom and bride along with the name of the witnesses is written in italic format. 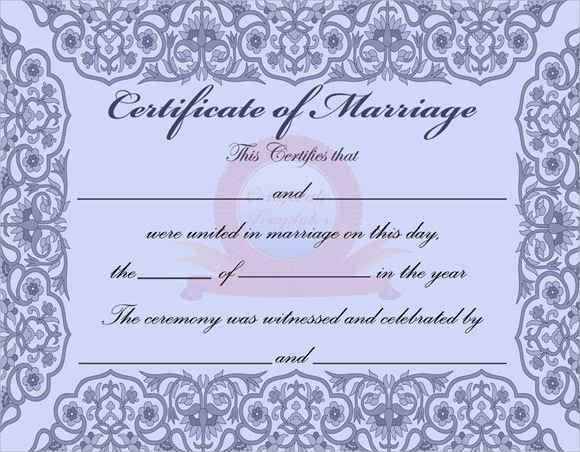 This sample of marriage certificate translation template is used by people who wish to translate their marriage to some other state or language. The sample follows a very professional and official approach. 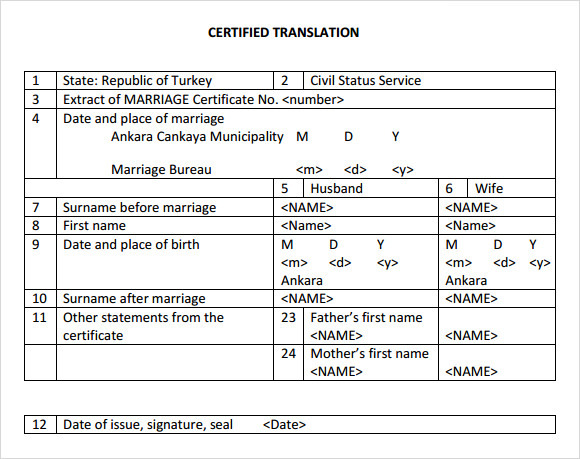 The template is dived in a number of rows and columns where the name of the translation country, the name o f the couple and witness is mentioned along with details regarding the date, time and venue of the wedding. 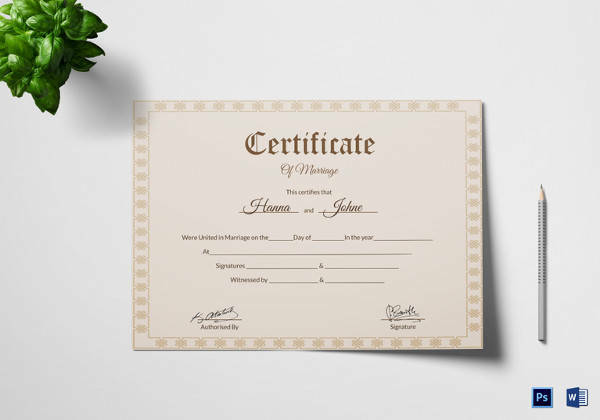 Marriage certificate template in Microsoft word is yet another example of a semi formal marriage certificate template that has an artistic decoration on the four sides of the page. The entire template is designed in black and white format which gives it a very classy and dignified look.